The V-22 Osprey is a joint-service, medium-lift, multimission tilt-rotor aircraft developed by Boeing and Bell Helicopters. Boeing is responsible for the fuselage, landing gear, avionics, electrical and hydraulic systems, performance and flying qualities. Bell Helicopter Textron is responsible for the wing and nacelle, propulsion, rotor, empennage (complete tail system), ramp, overwing fairing and the dynamics. A total of 112 V-22s are currently operated by the US Air Force (USAF) and the US Marine Corps (USMC). The aircraft operates as a helicopter when taking off and landing vertically. The nacelles rotate 90° forward once airborne, converting the aircraft into a turboprop aircraft. The aircraft can provide VTOL (vertical take-off and landing) with a payload of 24 troops, or 6,000lb of cargo at 430nm combat range, or VTOL with a payload of 8,300lb of cargo for a range of 220nm. The helicopter is self-deployable worldwide, with a ferry range over 2,100nm. Normal operating range is up to 1,100nm. 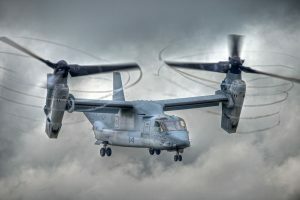 The tilt-rotor aircraft is available in three configurations: the Combat Assault and Assault Support MV-22 for the USMC and the US Army; the long-range special operations CV-22 for US Special Operations Command (US SOCOM); and the US Navy HV-22, for combat search and rescue, special warfare and fleet logistic support. The first of four LRIP (low-rate initial production) MV-22 models completed operation and evaluation in August 2000. Following a crash in December 2000, a number of upgrades have been implemented including redesign of hydraulics and wiring in the nacelles and improved flight control software. 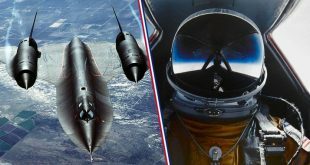 A two-year flight test programme began in May 2002 and a second OP/EVAL phase began in March 2005. USAF CV-22 resumed flight testing in September 2002. The first CV-22 was delivered to the USAF in October 2005. 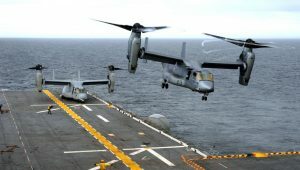 A further 11 LRIP aircraft (nine MV-22 and two CV-22) were ordered in May 2003, 11 (eight MV-22 and three CV-22) in February 2004 and 11 (nine MV-22 and two CV-22) in January 2005. The V-22 was approved for full-rate production in September 2005. The MV-22 achieved initial operating capability in June 2007 and left for its first operational deployment in Iraq in September 2007, with USMC Squadron 263. Initial operating capability for the CV-22 was achieved in March 2009, but a CV-22 flew a first search and recovery mission from Kirtland AFB, New Mexico, in October 2007. A five-year contract for 141 MV-22 and 26 CV-22 was placed in March 2008. In total 360 MV-22 (to replace CH-46 Sea Knight) and 50 CV-22 (to replace MH-53J Pave Low helicopters) are required. The 100th V-22 Osprey was delivered in March 2008. In July 2006, two MV-22 Ospreys completed flights crossing the Atlantic to take part in the flying display at Farnborough International Airshow. The MV-22 was deployed for the first time in an offensive combat mission known as Operation Cobra’s Anger in December 2009. The first five MV-22 Osprey containerised flight training devices (CFTD) were delivered to the USMC in 2009 to train aviation cadets on basic aircraft familiarisation and handling. The last CFTD was delivered in September 2010. The V-22 achieved 100,000 flight hours milestone in March 2011. 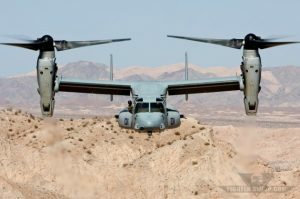 In June 2011, the Israel Air Force (IAF) unveiled the decision to send its team to the US for evaluating the V-22 Osprey. The IAF will acquire V-22s to carry out search and rescue, and special covert operations. The Osprey will replace IAF’s ageing fleet of Sikorsky CH-53 Sea Stallion transport helicopters. The V-22 is fully shipboard compatible, with the world’s first complete blade fold and wing stowage system. It is able to operate off all US Navy L-class amphibious ships, the LHA/LHD assault carriers, and can be stowed on full-size CV/CVN carriers. For stowage, the wings are rotated to lie above and parallel to the fuselage to create a compact rectangular volume. The automatic wing and rotor folding sequence, which can be completed in 90 seconds in a 60kt wind, is as follows: the aircraft lands in helicopter mode; the two outboard blades of each rotor are folded inboard; the nacelles are rotated forward to cruise mode; and the wings are rotated by 90° clockwise. The glass cockpit is equipped with six night-vision goggle compatible displays including four 6in square color active matrix liquid crystal multifunction displays, a shared control display unit and a standby flight display. The flight crew have a pilot’s night-vision system and a Honeywell integrated helmet display. The standby altitude indicator and the standby flight display are supplied by Smiths Industries. The cabin and the cockpit are NBC (nuclear, biological and chemical warfare) protected with a positive pressure filtered air system. The aircraft is armed with an M240G 7.62mm machine gun mounted on the back ramp. 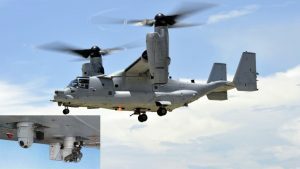 In January 2008, BAE Systems was awarded a contract by the US SOCOM for the rapid development and installation of a remotely operated weapon turret for the MV-22, based on the remote guardian system (RGS), which provides 360° coverage. The RGS is belly-mounted on the MV-22 and is armed with a GAU-17 7.62mm minigun. BAE Systems installed the first system on a CV-22 in February 2008 for ground and flight testing. The US Air Force and US Navy variants are equipped with a Raytheon AN/APQ-186 terrain-following, multimode radar. The helicopter night-vision system is the Raytheon AN/AAQ-16 (V-22) FLIR, which is mounted on the nose. This system contains a 3-5 micron indium antimonide staring focal plane array. 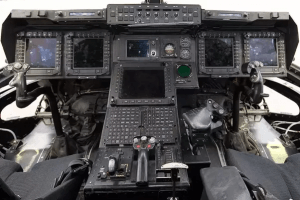 The aircraft’s electronic warfare suite includes the ATK AN/AAR-47 missile warning system, which consists of four electro-optic sensors with photomultipliers, a signal processing unit and a cockpit display. The aircraft is also equipped with a radar and infrared threat warning system and chaff and flare dispensers with 60 rounds of dispensables. The CV-22 features the suite of integrated radio frequency measures (SIRFC) developed by ITT Avionics. The aircraft is powered by two Rolls-Royce AE1107C turboshaft engines rated at 4,586kW maximum continuous power. The engines are fitted with full-authority digital electronic control (FADEC) supplied by Lucas Aerospace, backup analog electronic control system, and fire protection system from Systron Donner. A transmission interconnect shaft provides single-engine operation. The thermal signature of the aircraft is minimised with an AiResearch infrared emission suppression unit, installed on the nacelles near the engine exhaust. The entire rotor, transmission and engine nacelles tilt through 90° in forward rotation and are directed forwards for forward flight, and through 7° 30′ in aft rotation for vertical take-off and landing. The V-22 can climb at the rate of 16.2m/s. The maximum and cruise speeds of the aircraft are 565km/h and 510km/h respectively. The range is 3,379km. The combat range and service ceiling are 692km and 7,620m respectively.